There are curiosities at every turn in Seoul. Today I went to a children’s cafe and was amazed at the simplest of things – the toilet! The bathroom attendant kept pointing at my slippers, and then at the floor. What could she mean? There were some wacky looking Union Jack slippers inside the bathroom – so I slipped my cafe slippers off and slipped my feet in those. Relief – she let me in. And then she directed me to the male head. “Lady too long.” Fine, I thought, any toilet was fine. 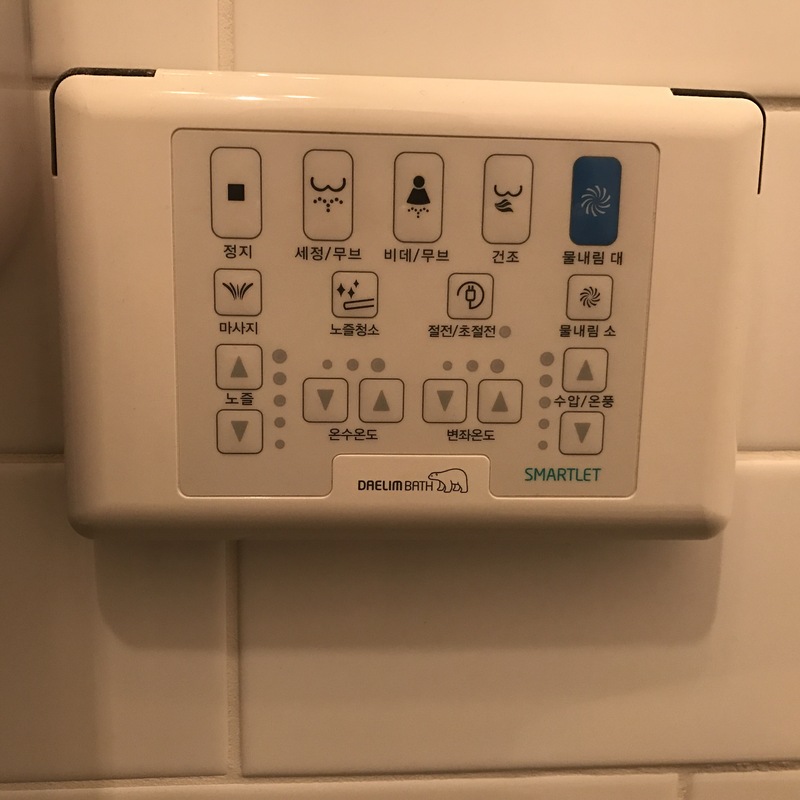 I was so happy when I sat down and felt the heated seat – whew, I love modern Asian toilets! But then I couldn’t find the handle to flush, because it’s not there. Instead there’s a panel on the wall with several options. What button would you push? I went with the colored one, and it did the job! Stand by – I’ll try each button one day in a less busy setting and report on all of the options. 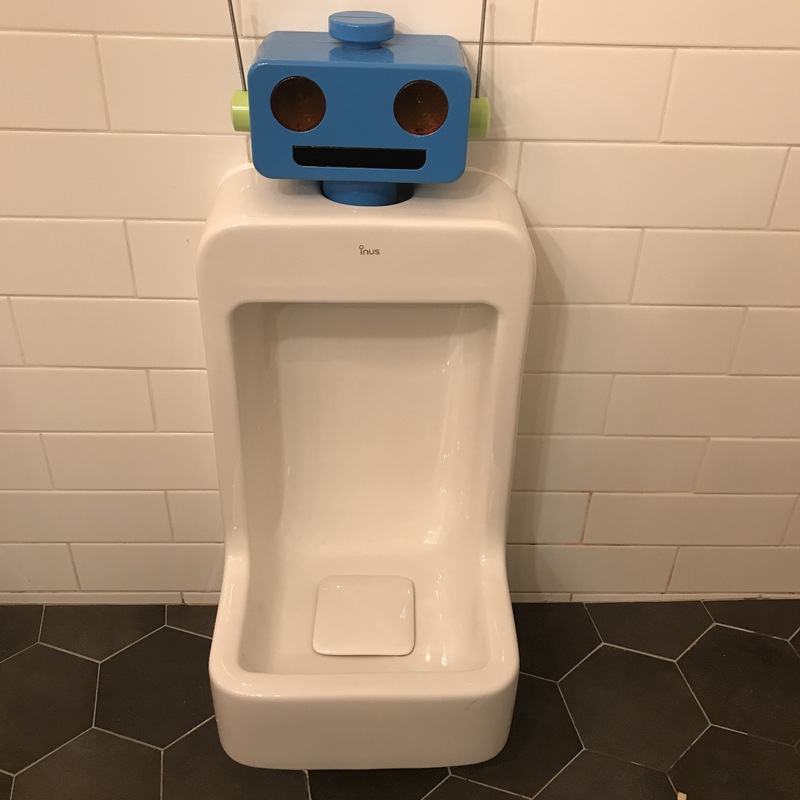 On my way out I saw the boy’s urinal – isn’t it cute? I almost threw some water down to see if it lit up or played a message, but I could hear people waiting outside. You can buy those seats here in US. Getting an outlet near the toilet is usually the difficult part. First time I experienced one of those was the SAS/United lounge at Incheon after 3 weeks in the field. So amazing. That’s good to hear because I have a feeling we’re going to get used to these!